Half a dozen more stories featuring the inimitable Horace Rumpole, everyone's favorite barrister for the defense. 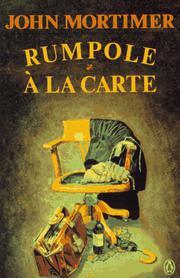 Judged as detective fiction, Mortimer's work is as mediocre as ever: Rumpole's cases, whether pursued in court or on a cruise ship, are seldom mystifying, involving few suspects, fewer clues, and even fewer stock reversals. The mystery is always being crowded out by the background--the threat to allow solicitors to argue cases before the bench; Rumpole's battle of wills with an equally opinionated French-Irish chef; his running arguments with Mr. Justice Graves ("Mr. 'Get into Bed with the Prosecution' Graves"); his colleague Claude Erskine-Brown's witless philandering; the iron whims of his wife Hilda; and the tapestry of witty allusions and ironic remarks--in short, all the features Rumpole's admirers cherish. This collection pinks all the usual targets, provides all the usual pleasures, and includes two gems: "Rumpole for the Prosecution," in which the old reliable switches sides to prosecute a murder case, with amusingly disastrous results; and the title story, whose star performance is turned in by a mouse on luckless Claude's attractive dinner partner's covered tray at that chef's three-star restaurant. The mixture as before, hearty as Rumpole's beloved mashed spuds.